(Francisco Kjolseth | Francisco Kjolseth) The iconic trolley car, which has been sitting in storage for several years, is moved back into view at Trolley Square on Monday, Oct. 15, 2018, as people gather for the repositioning ceremony. The empty trolley car, last seen housing the Trolley Wing Co., was moved into place on the north plaza by Pottery Barn. 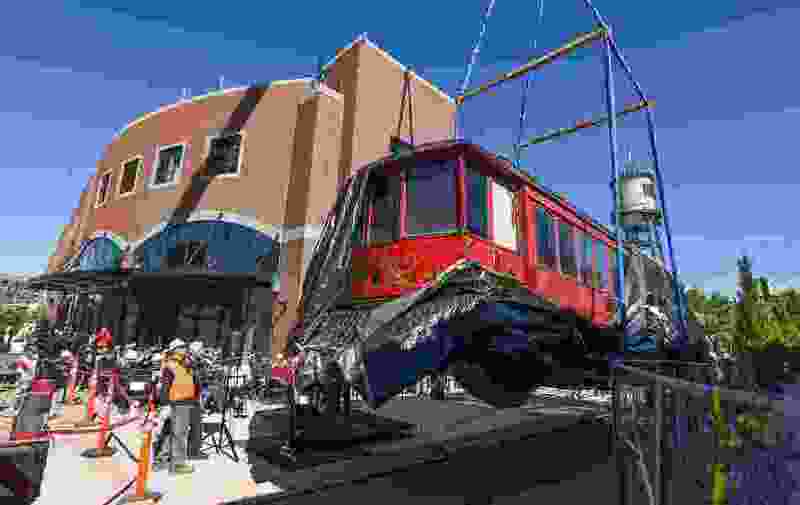 There was a high-flying homecoming Monday at Trolley Square as a giant crane lifted a century-old streetcar into the air and then glided it to its rightful place outside the Salt Lake City shopping center. Believed to be one of the city’s oldest electric streetcars, it was placed on the north plaza, near Pottery Barn, where it will undergo renovations and then ultimately be home to a new mall tenant, said Taymour B. Semnani, general counsel for SK Hart Properties, the company that owns the shopping center on 700 East between 500 South and 600 South. (Francisco Kjolseth | Francisco Kjolseth) The iconic trolley car, that has been sitting in storage for several years, is moved back into view at Trolley Square on Monday, Oct. 15, 2018 as people gather for the repositioning ceremony. The empty trolley car, last seen housing the Trolley Wing Company was moved into place on the north plaza by Pottery Barn. (Francisco Kjolseth | The Salt Lake Tribune) Framed by the wheels of the last Utah trolley car hanging from a giant crane, Khosrow Semnani, owner of Trolley Square makes takes the stage for a few remarks before the repositioning of the iconic trolley car, that has been sitting in storage for several years, and was moved back into view at Trolley Square on Monday, Oct. 15, 2018. Marking a 110 year history and last seen housing the Trolley Wing Company, the now empty car was moved into place on the north plaza by Pottery Barn. (Francisco Kjolseth | Francisco Kjolseth) The iconic trolley car, that has been sitting in storage for several years, is moved back into view at Trolley Square on Monday, Oct. 15, 2018. The empty trolley car, last seen housing the Trolley Wing Company was moved into place on the north plaza by Pottery Barn. (Francisco Kjolseth | Francisco Kjolseth) The iconic trolley car, that has been sitting in storage for several years, is moved back into view at Trolley Square on Monday, Oct. 15, 2018 as people take a tour of the now empty car. The last Utah trolley car was moved into place on the north plaza by Pottery Barn. 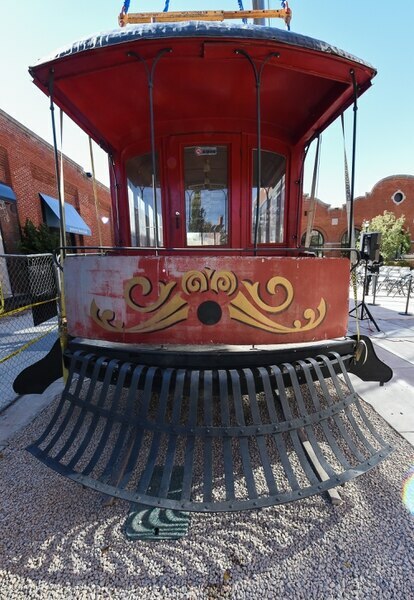 (Francisco Kjolseth | Francisco Kjolseth) The iconic trolley car, that has been sitting in storage for several years, is moved back into view at Trolley Square on Monday, Oct. 15, 2018 as people gather for the repositioning ceremony. The empty trolley car, last seen housing the Trolley Wing Company was moved into place on the north plaza by Pottery Barn. (Francisco Kjolseth | The Salt Lake Tribune) The iconic trolley car, that has been sitting in storage for several years, is moved back into view at Trolley Square on Monday, Oct. 15, 2018 as people gather for the repositioning ceremony. The empty trolley car, last seen housing the Trolley Wing Company was moved into place on the north plaza by Pottery Barn. 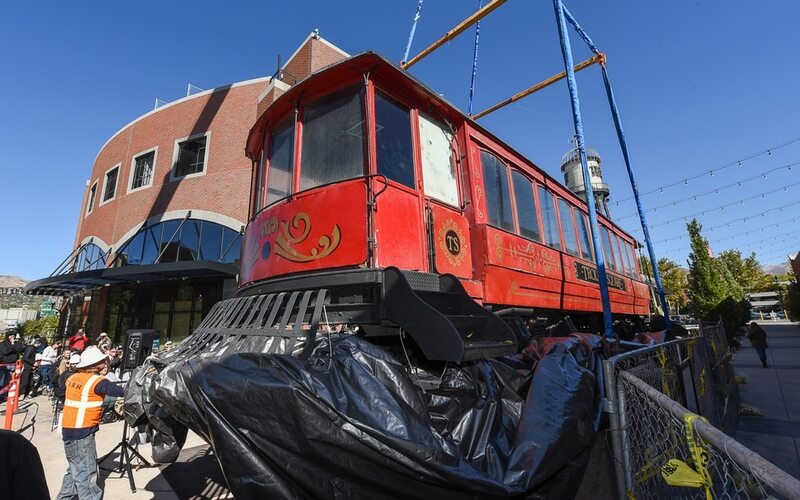 (Francisco Kjolseth | The Salt Lake Tribune) The iconic trolley car, that has been sitting in storage for several years, is moved back into view at Trolley Square on Monday, Oct. 15, 2018. The empty trolley car, last seen housing the Trolley Wing Company was moved into place on the north plaza by Pottery Barn. (Francisco Kjolseth | The Salt Lake Tribune) The iconic trolley car, that has been sitting in storage for several years, is moved back into view at Trolley Square on Monday, Oct. 15, 2018. The empty trolley car, last seen housing the Trolley Wing Company was moved into place on the north plaza by Pottery Barn. (Francisco Kjolseth | The Salt Lake Tribune) Kirk Walton of Salt Lake City overlooks his photos of the last Utah trolley car as he recalls how his great grandfather Robert Lamont Sr. used to be a conductor of the trolley's. The iconic trolley car, that has been sitting in storage for several years, was moved back into view at Trolley Square on Monday, Oct. 15, 2018. (Francisco Kjolseth | The Salt Lake Tribune) The iconic trolley car, that has been sitting in storage for several years, is moved back into view at Trolley Square on Monday, Oct. 15, 2018. The empty trolley car, last seen housing the Trolley Wing Company was moved into place on the north plaza by Pottery Barn. (Francisco Kjolseth | The Salt Lake Tribune) The iconic trolley car, that has been sitting in storage for several years, is moved back into view at Trolley Square on Monday, Oct. 15, 2018. The empty trolley car, last seen housing the Trolley Wing Company was moved into place on the north plaza by Pottery Barn. (Francisco Kjolseth | The Salt Lake Tribune) The iconic trolley car, that has been sitting in storage for several years, is moved back into view at Trolley Square on Monday, Oct. 15, 2018. The empty trolley car, last seen housing the Trolley Wing Company was moved into place on the north plaza by Pottery Barn. (Francisco Kjolseth | The Salt Lake Tribune) Khosrow Semnani, owner of Trolley Square makes a few remarks before the repositioning of the iconic trolley car, that has been sitting in storage for several years, and was moved back into view at Trolley Square on Monday, Oct. 15, 2018. Marking a 110 year history, the last trolley car in Utah, last seen housing the Trolley Wing Company was moved into place on the north plaza by Pottery Barn. (Francisco Kjolseth | The Salt Lake Tribune People gather to witness the iconic trolley car, that has been sitting in storage for several years, as it is moved back into view at Trolley Square on Monday, Oct. 15, 2018. The empty trolley car, last seen housing the Trolley Wing Company was moved into place on the north plaza by Pottery Barn. (Francisco Kjolseth | The Salt Lake Tribune) Boris Walther, 78, takes a trip down memory lane as he tours the inside of the last Utah trolley car. Walther, the last living wood craftsman that worked on the trolleys back in 1972, recalls the details seen inside following a repositioning of the iconic trolley car on Monday, Oct. 15, 2018, that has been sitting in storage for several years and was placed back into view at Trolley Square. (Francisco Kjolseth | The Salt Lake Tribune) The iconic trolley car, that has been sitting in storage for several years, is moved back into view at Trolley Square on Monday, Oct. 15, 2018 as people gather for the repositioning ceremony. The empty trolley car, last seen housing the Trolley Wing Company was moved into place on the north plaza by Pottery Barn. (Francisco Kjolseth | The Salt Lake Tribune) Boris Walther, 78, right, takes a trip down memory lane as he tours the inside of the last Utah trolley car alongside trolley enthusiast Bob Mertens. Walther, the last living wood craftsman that worked on the trolleys back in 1972, recalls the details seen inside following a repositioning of the iconic trolley car on Monday, Oct. 15, 2018, that has been sitting in storage for several years and was placed back into view at Trolley Square. 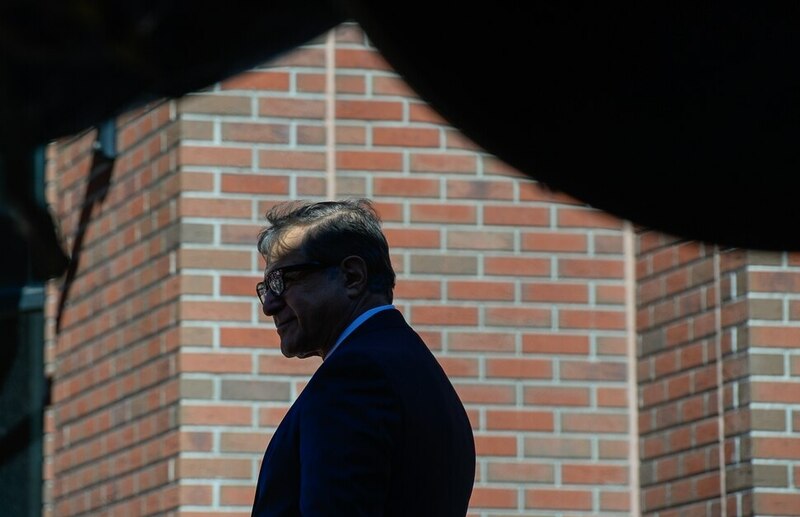 Semnani said his father, Khosrow Semnani, who purchased Trolley Square in 2012, chose Monday, the 110th anniversary of the trolley fleet building, for the streetcar’s return. According to historians, the first electric streetcar left the trolley building for public service on Oct. 15, 1908. Considered state-of-the-art at the time, the building held 144 double-truck streetcars, was divided into four massive bays with four tracks each and a total of 208 skylights, according to Trolley Square’s online history page. As fire was always a risk, the iconic 50,000-gallon water tower was built. 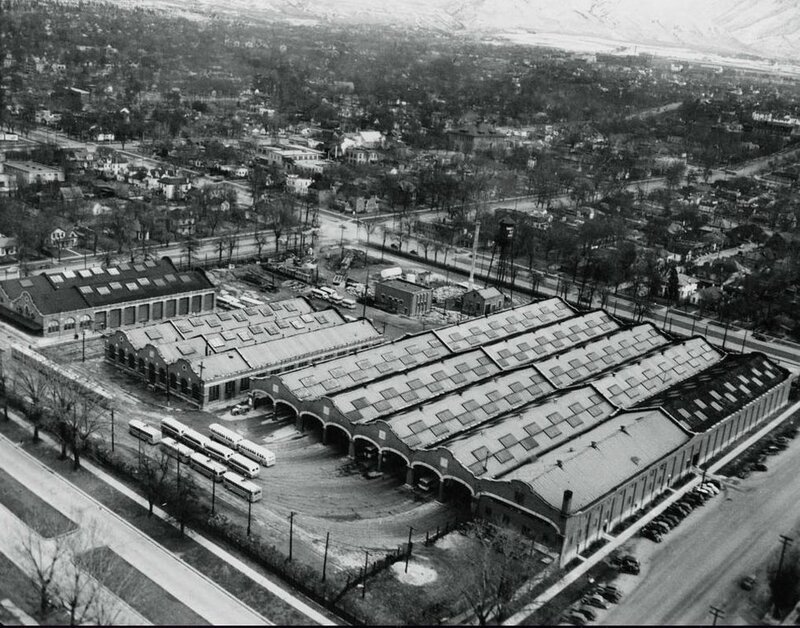 Courtesy | Utah State Historical Society Aerial view of the car barns, now Trolley Square, January 20, 1945. Buses and cars replaced the trolley system by the mid-1940s. The trolley barns sat empty for decades, until a family purchased the property in 1972 and adapted them for retail use. They hired architect Wally Wright, who used Ghirardelli Square — the San Francisco chocolate factory refinished as a shopping center — as his inspiration. Through the years, the trolley car, which sat beneath the water tower, served as home to State Savings Bank and, later, Trolley Wing Co., a tavern that specialized in 3.2 beer, chicken wings and camaraderie — regulars got their own beer mug to hang on the wall. In 2010, the mall’s previous owners removed the trolley to make way for Whole Foods Market, an anchor in a multimillion-dollar renovation. Since then, the car has sat on the empty lot on 600 South, just south of the mall. When SK Hart acquired the property, the trolley car was among the assets included in the purchase. Seeing the vacant trolley car wrapped in plastic was painful for Jess Wilkerson, the owner of Trolley Wing Co., who was forced to move his business from the streetcar that gave his business its name. After the move, Trolley Wing operated in a makeshift spot inside Trolley Square for four years during mall construction — only to be evicted again. Wilkerson and several Trolley Wing Co. regulars — the bar now has locations in Sugar House and Midvale — attended Monday’s streetcar return. “I’m on cloud nine," he said, noting that before he was evicted, he tucked his personal beer mug in the trolley car ceiling. “I’ve been waiting for this for a long time." Wilkerson said he plans to meet with SK Hart officials about possibly reopening Trolley Wing Co. in its original home. It could definitely fit into SK Hart’s future plans. In April, the owners said they intend to add theaters, a food and beer hall, fitness venues and a multifamily development, with the existing pedestrian bridge on 600 South connecting the housing project to the mall. “One of the first pieces of that multifamily project,” said Taymour Semnani, “was to move the trolley off the south lot."